Valerie passed away at Greenwoods Eldercare. She is survived by her loving long time partner Tom Thomas and her sister Jacqueline Gilbert. Valerie was born at Stourport on Severn in Worcestershire, England. 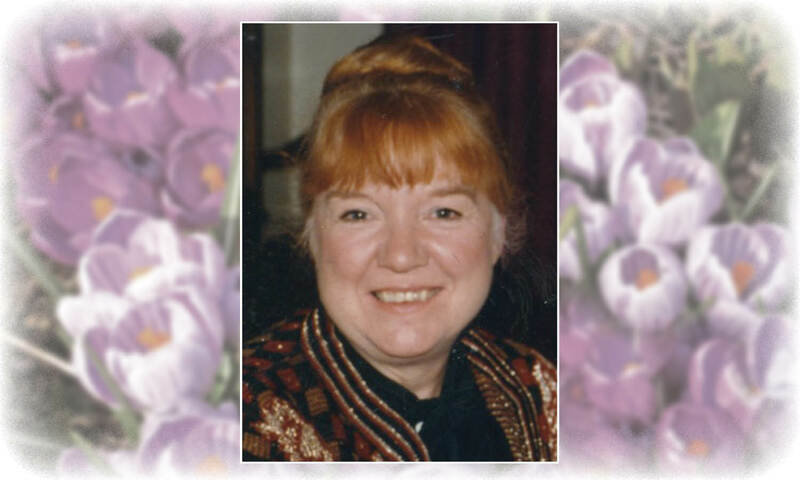 She always had a love of the arts, music and needlework. She loved movies and would make her own clothes copied from the styles of the time coming out of Hollywood. Valerie met and married Les Perry, they moved to London where she went on to become a dressmaker and designer. She and Les spent some time in Nigeria where the people had never seen a person with flaming red hair and they were quite fascinated and wanted to touch her hair to see if it was real. Val and Les eventually emigrated to Canada and settled in Edmonton where she went to Secretarial College. After a few years they moved to Victoria and she worked at the University of Victoria. It was at this time that the marriage dissolved. Valerie decided that the time was right for a change, she had always wanted to get a university education, so she returned to Edmonton to attend the University of Alberta. Valerie was able to get a job at the university bookstore while obtaining a Bachelor of Arts and a Bachelor of Education degree. Valerie fell back on her secretarial skills to become Executive Secretary in the university president’s office. It was here that Valerie met and fell in love with Tom. Val and Tom lived in Edmonton until retiring to Salt Spring Island in 1994. Tom and Valerie built their dream home here on Salt Spring where every morning they enjoyed waking up to the lovely view over the strait to Galiano Island. Valerie was a longtime active volunteer with Lady Minto Thrift Store and the Seniors for Seniors. Valerie is greatly missed by Tom and Jackie and all her friends here on Salt Spring Island. A special thank you to all the wonderful staff at Greenwoods and to Dr. Mommsen-Smith for your care of our Valerie. A celebration of life to be announced at a later date. In lieu of flowers, a donation to Greenwoods Eldercare would be appreciated.